Yale Face Database(http://cvc.yale.edu/projects/yalefaces/yalefaces.html) - 165 images (15 individuals) with different lighting, expression, and occlusion configurations. DeepMind QA Corpus (https://github.com/deepmind/rc-data) - Textual QA corpus from CNN and DailyMail. More than 300K documents in total. [Paper](http://arxiv.org/abs/1506.03340) for reference. LSUN https://arxiv.org/abs/1506.03365v3 one million labeled images for each of 10 scene categories and 20 object categories. A Large Dataset of Object Scans http://redwood-data.org/3dscan/ More than ten thousand 3D scans of real objects. MovieLens http://grouplens.org/ 22,000,000 ratings and 580,000 tags applied to 33,000 movies by 240,000 users. YouTube-8M https://research.google.com/youtube8m/ 8 million YouTube video IDs and associated labels from a diverse vocabulary of 4800 visual entities. http://www.msmarco.org/ Microsoft has released a massive database to 100,000 question and answer pairs written by humans to help AI researchers train their machines to extract information better from websites and respond more naturally to questions asked by users. Frames is precisely meant to encourage research towards conversational agents which can support decision-making in complex settings, in this case - booking a vacation including flights and a hotel. More than just searching a database, we believe the next generation of conversational agents will need to help users explore a database, compare items, and reach a decision. https://arxiv.org/abs/1606.08513v3 This paper presents a new selection-based question answering dataset, SelQA. https://arxiv.org/pdf/1511.06348v2.pdf How much data is needed to train a medical image deep learning system to achieve necessary high accuracy? We publicly release a new large-scale dataset, called SearchQA, for machine comprehension, or question-answering. 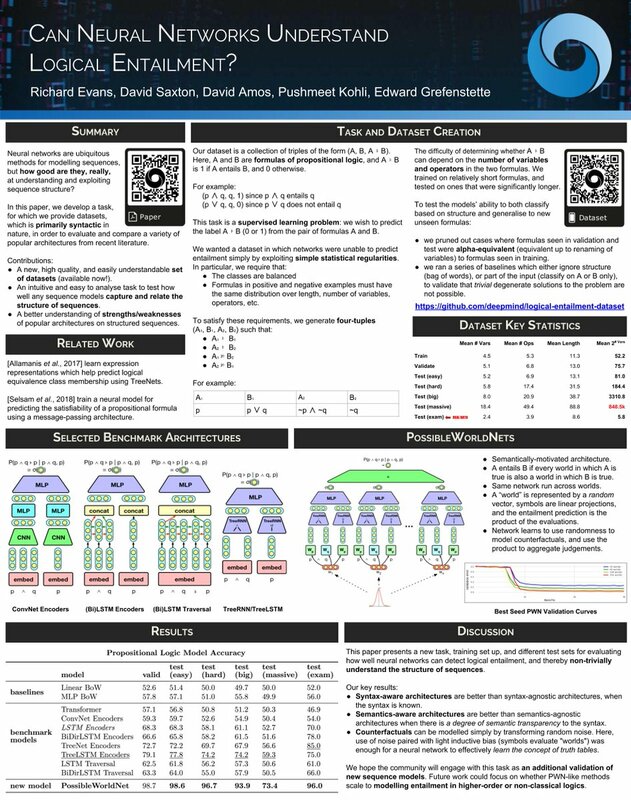 Unlike recently released datasets, such as DeepMind CNN/DailyMail and SQuAD, the proposed SearchQA was constructed to reflect a full pipeline of general question-answering. That is, we start not from an existing article and generate a question-answer pair, but start from an existing question-answer pair, crawled from J! Archive, and augment it with text snippets retrieved by Google. Following this approach, we built SearchQA, which consists of more than 140k question-answer pairs with each pair having 49.6 snippets on average. Each question-answer-context tuple of the SearchQA comes with additional meta-data such as the snippet's URL, which we believe will be valuable resources for future research. We conduct human evaluation as well as test two baseline methods, one simple word selection and the other deep learning based, on the SearchQA. We show that there is a meaningful gap between the human and machine performances. This suggests that the proposed dataset could well serve as a benchmark for question-answering. We present DepCC, the largest-to-date linguistically analyzed corpus in English including 365 million documents, composed of 252 billion tokens and 7.5 billion of named entity occurrences in 14.3 billion sentences from a web-scale crawl of the Common Crawl project. http://www.msmarco.org/ MS MARCO(Microsoft Machine Reading Comprehension) is a large scale dataset focused on machine reading comprehension, question answering, and passage ranking.